Step aboard the magnificent BELLA RONA and enter a whole new world of luxury. BELLA RONA displays the unmistakable quality of a Ferretti in her sleek lines and build. BELLA RONA goes beyond the high Ferretti standards with a new modern decor and furnishings. Whether your idea of the perfect holiday is action-filled adventure or the joy of solitude and quiet contemplation, the hand-picked and highly-qualified crew will make your stay the voyage of your dreams. BELLA RONA has a full complement of water toys and two tenders. Guests can enjoy the water sports right from the boat or go exploring on nearby reefs and beaches. 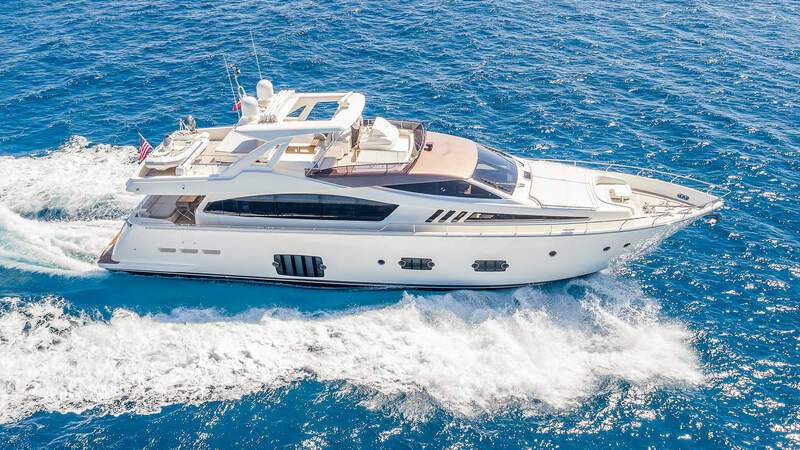 The 81’ (24.7m) BELLA RONA offers three levels of living space, generous on deck areas, a superb selection of amenities and service by an outstanding captain and crew.